This extraordinary, eye-catching home, the product of Mexico's Taller Estilo Arquitectura, pours the plenty of colour and creativity into an amazing villa-style construction, proving you should never censor yourself when infusing your dream home with playful personality! From the outset the villa presents a glorious, striking facade, with its vibrant, pink exterior beaming out from the street. 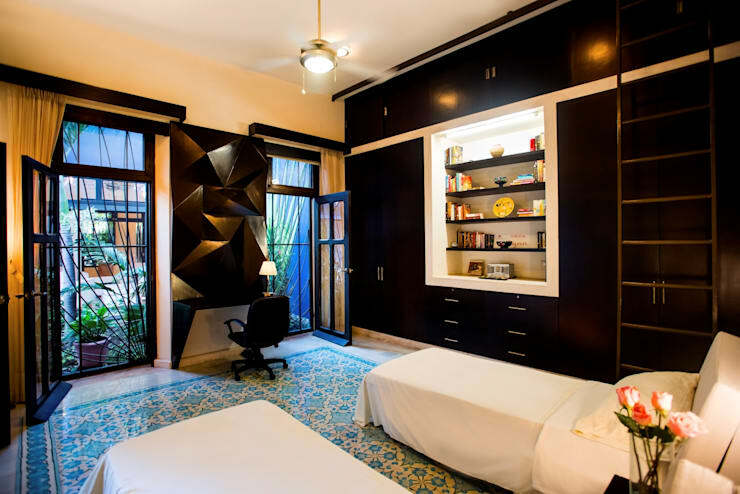 Upon entrance, the designers have showcased myriad delightful decorative elements, with each spacious room lined with a range of intricate, coloured floor tiles and sporting sophisticated, modern furnishings. The creativity throughout the villa is incredibly impressive. A curved island bench in the kitchen embraces the occupants with its unique design and relaxed finish, while a small garden lines the home's shower unit, infusing the room with a sense of delicacy and refreshment. The bedrooms are also colourful and inviting, with each bordering an outdoor living space, capitalising on the home's beautiful climate and gardens. The back yard of the home plays host to its crowning jewel however, with a curved swimming pool glistening amongst more towering, pink walls, and an uncover area for outdoor entertainment included, with its roof doubling as an elevated deck on which the occupants can relax, unwind and soak up some sun! From the outset this home delights with its playful use of colour, as its vibrant, pink facade bursts out onto the street to stunning effect. The use of this engaging hue is a bold statement, and contrasts brilliantly against the black of the home's garage door and iron fence and the lush green of the foliage populating the front yard. Such striking bursts of colour immediately intrigue and enchant passers-by, who could be forgiven for wanting to gain a glimpse inside this amazing property! 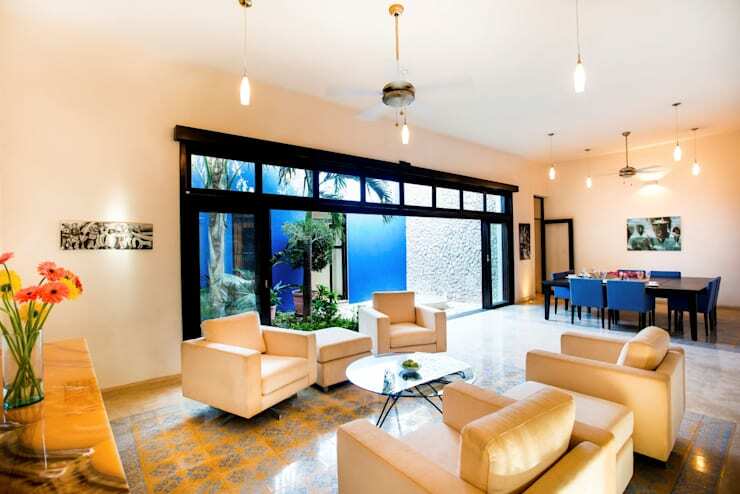 Upon entrance the home presents and open and inviting villa-style design, with patterned tiles lining the floors of each room, conjuring the vibrancy of the exterior but with a greater degree of intricacy. The interior walls and ceilings have been dressed in muted tones, with the designers clearly content with the flooring drawing the primary focus within the abode. The living and dining furnishings have also been kept relatively simple, so as not to overwhelm the space with a clash of loud, decorative elements. Outside, however, a vibrant, blue feature wall draws the gaze, inviting onlookers to explore the cosy courtyard beyond. 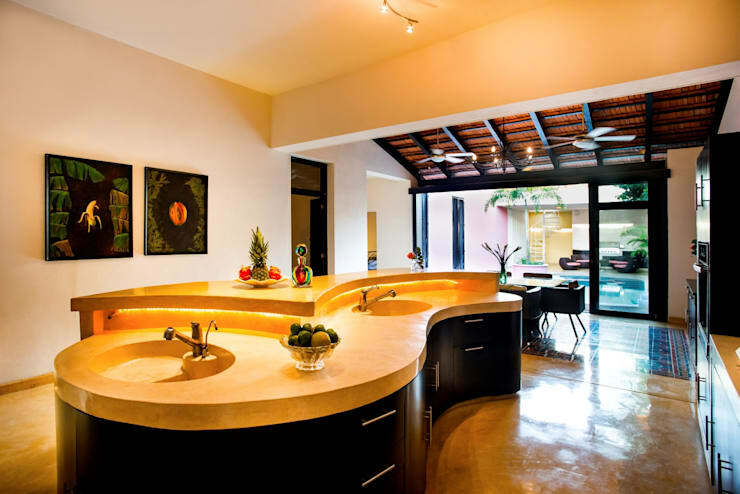 The home's kitchen showcases an extraordinarily bold and creative design, the curves of the kitchen island immediately drawing focus within the room. While many modern kitchens go to great pains to appear sleek and streamlined, the curves within this space, coupled with the island's warm tone and slightly textured finish, emit a playful and inviting allure. In the distance we can see a second dining area has been included, bordering the home's primary outdoor area, which we will soon examine in closer detail. 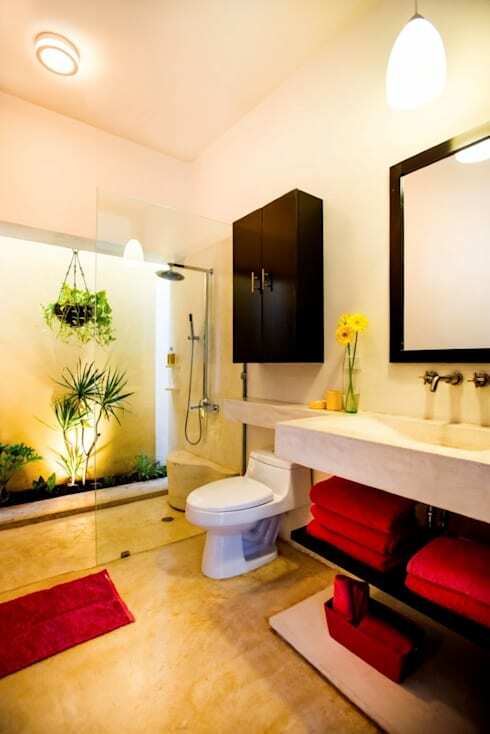 The home's bathroom presents the same playful approach to decor and decoration as the kitchen, with the warm tone of beautifully lit alabaster comprising the decor and a novel, indoor garden lining the shower unit. The space exudes a strong embrace, with its polished stone flooring infusing the room with an air of tradition, and the vibrant green of the garden plants adding a refreshing delicacy. 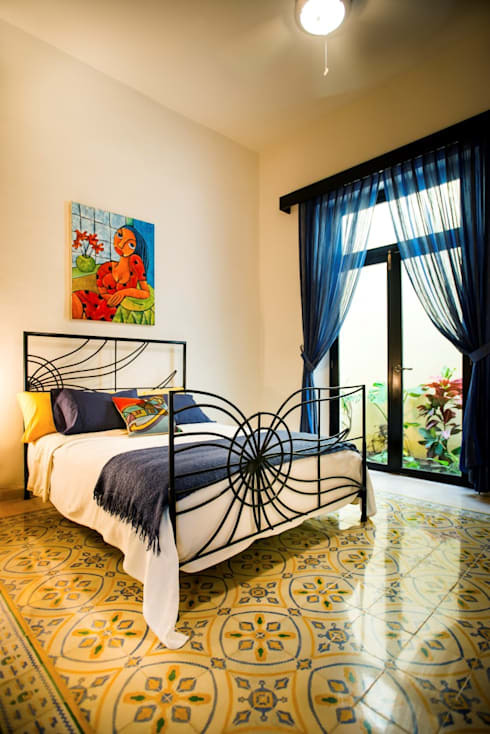 The bedrooms in this marvellous abode delight with bursts of colour, from the patterned tiles lining the floors to the blue curtains and vibrant artwork decorating this space. The flowing curves of a wrought iron bed frame a simple, comfortable space for rest and relaxation, while expansive French doors lead out to a private garden, which awaits to sooth and refresh the occupants whenever needed. This beautiful guest bedroom showcases another stunning design within the villa, with twin, single beds resting atop its flowing, patterned floor. The depth of black wood adds another, intriguing layer within this space, seen both in the angular, sculptural design of the room's small desk and the generous array of drawers, shelves and cabinets built into the far wall. Best of all is that this room also borders an area for outdoor living, with the familiar, blue feature wall and accompanying plants of the home's small courtyard beaming in through its two external doors. 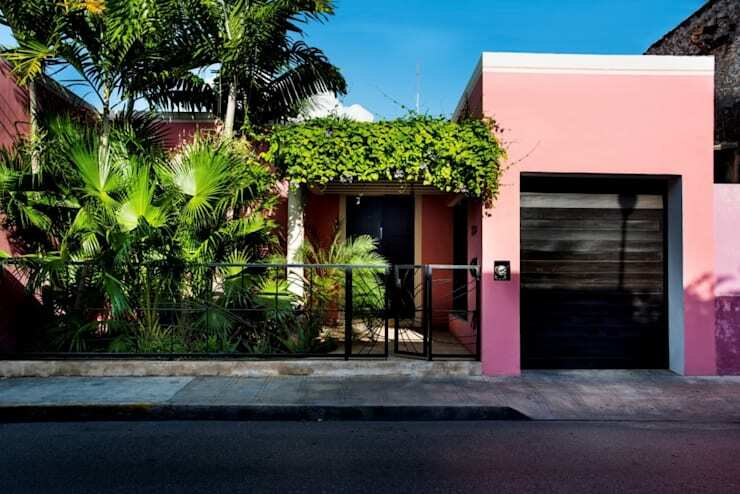 The final element to admire within this extraordinary home is the back yard, which rests resplendent in the same vibrant pink as the front facade. This pink wall towers over a curved pool of alluring green, with its pristine waters glowing and glistening amidst a range of ambient lighting. At the far end of the swimming pool an undercover space has been constructed, housing a contemporary outdoor setting and barbecue for summertime entertaining. Meanwhile, a spiral staircase leads up to an elevated deck, upon which the occupants can enjoy plenty of sun and a gorgeous view. 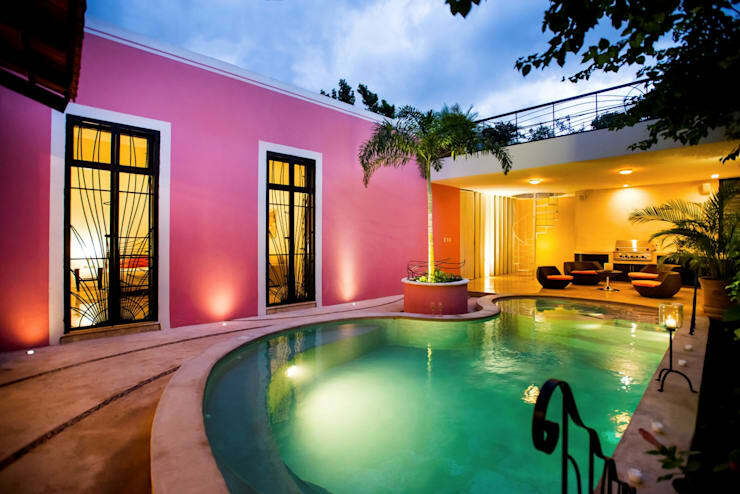 Are you a fan of colourful, playful designs like this vibrant, pink villa? Then take a look at The Colour Home where More is More for some decoration inspiration! Do you love a home filled with colour and vibrancy? Tell us your thoughts below!